For the past few years I've been incredibly interested in the way in which the public interacts with government agencies, the process in which designers brand for them, and more generally speaking, the way that design informs all aspects life. 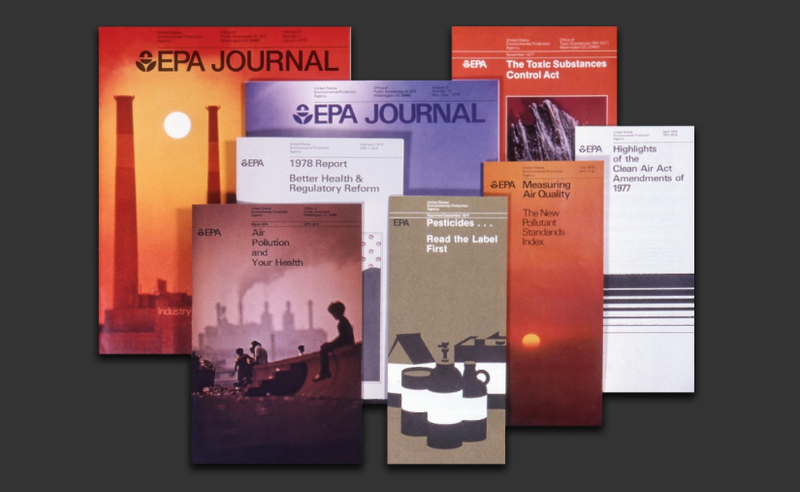 The 1970's EPA rebranding team, Chermayeff & Geismar ( now Chermayeff & Geismar & Haviv ) has worked on several other large scale identity projects as well including, the Library of Congress, the MoMA, PBS, etc. I hope this Kickstarter reaches it's goal of $158,000, so that this system may serve as a blueprint for good / sustainable design thinking, as well as a resource for students + professional designers to create with social / environmental / political change in mind. p.s. Check out Standards Manual to see the other cool! projects they've backed like The NASA Graphics Standards Manual by Richard Danne and Bruce Blackburn (that I proudly own), and The NYCTA Graphics Standards Manual, (that I'm still pining after) describing "the design and construction for the iconic NYC subway signs that we still use today."